Tourists who have visited the Battleship Missouri Memorial next to Ford Island in Pearl Harbor will find this easy-to-ready book to be an interesting memento and valuable historical supplement to their visit. This history was published in 1999, the same year that the battleship Missouri (BB-63) opened to the public as a museum ship. It has had five printings through the end of 2010, which demonstrates its popularity with tourists who stop at Battleship Missouri Memorial's Victory Store where it is sold. Unfortunately, the book has not been updated since its publication in 1999, so it has no photographs for new exhibits and areas of the ship opened to the public since then. Large-size historical photos fill this book, and many pages have fact boxes with interesting stories and information about USS Missouri. 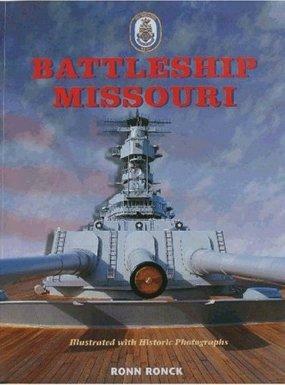 The battleship's history, including participation in three wars (World War II, Korean War, Persian Gulf War), is covered chronologically with two chapters about Missouri's conversion to a museum ship at Pearl Harbor. A couple of sections at the end of the book with the ship's key statistics and a brief chronology of significant events provide valuable summaries. Ronn Ronck, former newspaper feature writer and travel editor in Hawaii, has written or edited more than a dozen books about Hawaii. The high-quality writing and page layouts in Battleship Missouri reflect his many years of experience as a journalist, author, and editor. One short chapter on "Wartime Hawaii," although interesting, does not belong in this book on the battleship Missouri but rather appears to be just an extract from his 1982 book entitled Hawaiian Yesterdays: Historical Photographs. The two-page listing of ships present at Pearl Harbor at the time of the Japanese attack also does not have any relationship to Missouri, which did not get commissioned until June 1944. The kamikaze attack against USS Missouri on April 11, 1945, gets only brief coverage, but the book does have five photos related to the Zero fighter that hit the battleship and the funeral on the following day during which the remains of the kamikaze pilot were buried at sea. The topic of one interesting chapter with many historical photos is the Japanese surrender ceremony that took place aboard Missouri in Tokyo Bay on September 2, 1945. Ronck's book Battleship Missouri will please tourists who want a souvenir to remember their visit to the Battleship Missouri Memorial, but those persons who desire a more in-depth history of the ship should read Paul Stillwell's excellent 1996 book entitled Battleship Missouri: An Illustrated History.